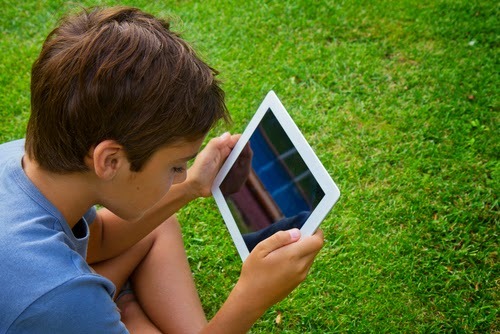 While your tween may only like to use the iPad for talking to their friends, watching videos and playing Minecraft, there are plenty of educational opportunities they will find equally entertaining. From interactive 3D imagery of the human body to games that teach vocabulary, U.S. history and math, there are endless possibilities. Here are some educational apps to download onto the iPad to maximize your child's learning experience outside of school hours. Bring out your child's competitive spirit with a twist on the classic game of Bingo. In Math Bingo, players can select to play using addition, subtraction, multiplication or division problems in three levels difficulty: easy, medium and hard. Players are given a math problem, and then select the answer from the bingo card. When a correct answer is recorded on the bingo card, a bug appears. To complete a game, you must get a pattern of five bugs in a row just like in regular Bingo. Games are scored by the number of correct answers and lowest time of completion. Your tweens will love competing with themselves to achieve their personal best, all while developing more nimble math skills. Availability & Price: Available for iOS and Android for $0.99. This visually stunning app is based on the reference book of the same name by Dorling Kindersley. The Human Body provides a highly detailed and accurate perspective of the human body. Designed specifically for use on the iPad, this app takes full advantage of the tablet's technology, featuring over 270 zoomable, high-resolution images that detail the body's 12 systems. Every image has in-depth annotations and explanatory text to provide thorough information about the body's elaborate inner workings. There also are videos to illustrate various bodily processes such as nerve impulse, inflammatory response and the heart beat. This is a must-have app for any tween with an interest in the medical field, or for visual learners who are struggling with biology or anatomy in school. Availability & Price: Available for iOS for $6.99. Are you looking for engaging and fun ways to help your tweens expand their vocabulary? World's Worst Pet is an iPad game that focuses on building a rich vocabulary through exposure to over 1,000 Tier Two words for grade levels 4–8. With four unique activities using word context, antonyms, synonyms and word sorting, students can develop a clear understanding of definitions through detailed explanations and easy-to-understand examples that are targeted by age level. The framework of this app was developed in alignment with the Common Core standards, and each word is repeated through the various games to ensure a more complete understanding. Whether your student is gifted in language arts or struggling to learn their vocabulary words, World's Worst Pet can help them reach new heights by making it entertaining to master new words. Availability & Price: Available for iOS for free. Presidents vs. Aliens makes learning presidential history a lot less boring through classic gamification. Players can review stats on each of the 44 United States presidents featured in the app using an interactive flashcard system. Then, players use the information learned from the flash cards to defeat the aliens as they try to take over our nation's capital. The game can be tailored for tweens at a range of learning levels. You can customize the types of questions from as simple as president identification to more complex ones about quotes and historical events. There also are two bonus games included within this app—Heads of State and Executive Order—which help diversify your tween's learning experience. 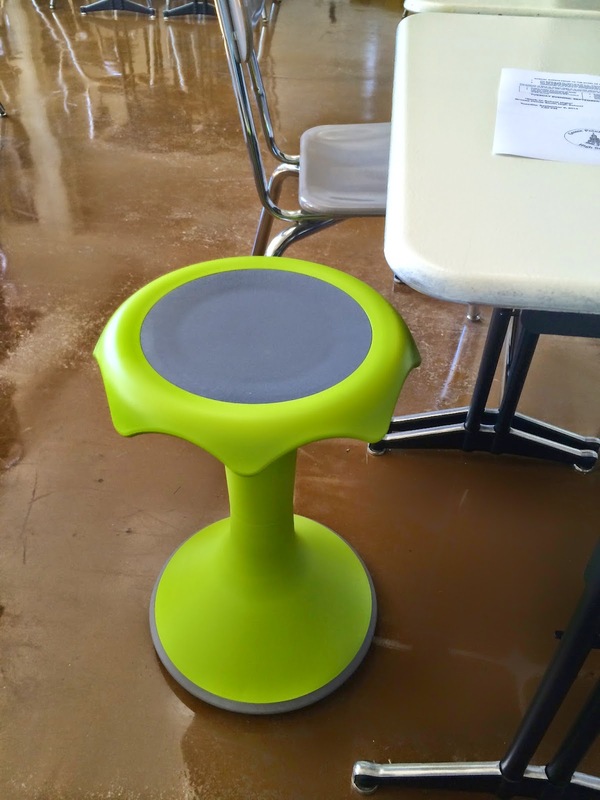 Are you sick of tacking on days at the end of the school year due to inclement weather? Come join Atlanta Public Schools as they share how they implemented virtual learning days to avoid extending their school year. See how their teachers have effectively expanded the walls of their classrooms by using engaging content and Blackboard’s learning management system. Mrs. Aleigha Henderson-Rosser currently serves as the Executive Director for Instructional Technology in the Atlanta Public School System. With over 19 years of educational experience, she has served as a Middle School Science Teacher, Instructional Technology Specialist, and Founder of the DeKalb Online Academy and Coordinator of Professional Learning overseeing the design, creation, and implementation of online and face to face professional learning opportunities for over 12,000 employees. Additionally, she managed Race to the Top Facilitators at over 140 school campuses to effectively coordinate and evaluate all tenets of the Race to the Top Grant to include Teacher and Leader Keys, Common Core Performance Standards, STEM, Lowest Achieving Schools and Data Systems to support Instruction. Mrs. Henderson-Rosser is pursuing a Doctorate degree from Georgia State University in Educational Policy Studies. Her International and National involvement in the technology community consists of serving as founding member and Board member of the International Association for K-12 Online Learning (iNACoL) – Georgia Chapter, member of the Learning Forward (formerly National Staff Develop Council), member of the International Society for Technology Education and member of the International Forum for Women in e- Learning (IFWE). 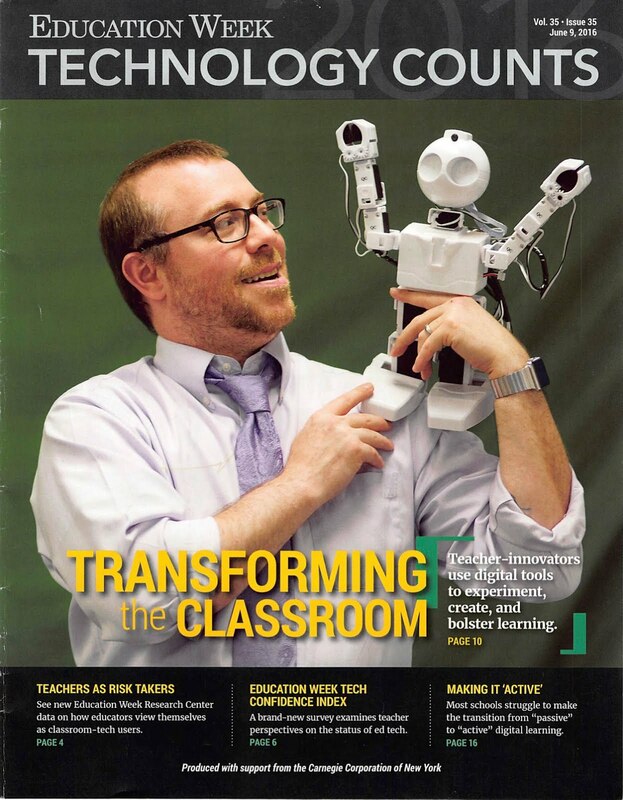 Mrs. Henderson-Rosser was recently published in the June 2010 ISTE Publication, “Leading and Learning with Technology, in a feature article entitled One Stop Shop PD – which focused on the implementation of Online Professional Learning in a large urban district. She has been a featured conference presenter at the AdvancED International Conference, International Society for Technology Education (ISTE) Conference, Georgia Educational Technology Conference, National Staff Development Conference and the Teachscape Leadership Conference. Mrs. Henderson –Rosser enjoys leading the work of the Department of Instructional Technology through 4 major areas: Creating Innovative Teacher Leaders, Online Professional Learning for Instructional Technology, Impact of Instructional Technology on Teaching and Learning and the implementation of 21st Century Teaching and Learning through digitally connected classrooms. 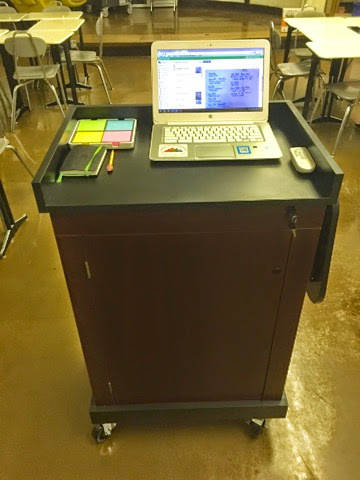 I'm really excited to share about the Oklahoma Sound Corp® Smart Cart that was sent to me by the awesome people at Quill.com. They read my posts and tweets on creating better #NerdySpaces for my students and wanted to help. One of the things I wanted to do was open up more space for my students and for myself. 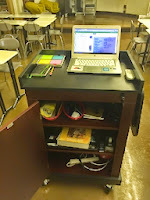 One of the ways I did that was by eliminating the teacher desk and the cabinets. Once those were removed, I had so much more room to move my desks around. I was able to set up 4 areas for student that look like conference table designs. It gives me tons more room to move around the middle of the class. One of the students said they really liked it because it made class more social. That was a huge endorsement for me. However, I found myself still needing a place to put a few important items in my class. I needed a spot for my laptop, iPad, and just a few other things that I use regularly in class. That is where the Oklahoma Sound Corp® Smart Cart from Quill come in and saves the day. The traditional lectern is something that I have used for many years. It was a place for me to stand and talk to the students all class. Over the past couple of years, I have found that I do not use the lectern as much as I used to. The stationary aspect of the lectern was the major problem. When I moved things around in my room, I realized I had more space and I would love to be able to move freely with the tools that I need. Here are a few photos that show my current setup. I am able to have my HP Chromebook on top along with my Evernote Post-Its and my Evernote Moleskine notebook. I am able to move freely around the room, look at my lesson plans, take notes, and roll from table to table to engage with my students. I am able to have conversations with my students and take notes on anything I might need to address with them later on in class. In the past, I would have to maneuver around multiple desks and avoid a mine field of bags and chairs to get to each student. It was an event that often ended in awkwardly bumping into students as I tried to move around. By moving the teacher desk and other items out of my room, I have opened up the room to movement and that has led to more engagement with my students. That has been key. The mobile lectern now allows me to move more freely around the room. With a wireless mouse and keyboard, I do not even have to stick to the front of the room. I can move around and still keep information on the board. I also can carry the gigantic textbook with me as I move from table to table as well because there is a cool little shelf that flips up and down. I love the Oklahoma Sound Corp® Smart Cart and it has made my class better. The freedom it gives me to move around and keep the important items I need for class is a difference maker. Here are just a few more things that I love about it. It comes with a power cord so that devices can be charged at night. I just wheel it over to an outlet, plug it in, and let my devices I've connected to the power strip charge. All of the doors come with locks so all of my devices can be safe when I leave them to charge over night and I can keep my phone, wallet, or anything else in a safe place while I teach during the day. The desk top slides open for more storage space. I love being able to keep my books or laptop in there for easy access. Lightweight to move around and it was very easy to assemble. If you are looking to change the way your class flows, if you are interested in creating learning spaces in your classroom that allow more freedom for the students and the teacher, you need to consider ordering a Oklahoma Sound Corp® Smart Cart from Quill.com right away. Going digital has made all information available at our finger tips. From research to consumption it is easy, however, to get lost in the rabbit hole of content. Join us as we will look at curation from start to finish. We will answer questions like how to find reliable information and tell its actually reliable and how to save this information so you can get back to it when you need it. We’ll examine the tools, sites and skills necessary to be a Master Curator. Steven W. Anderson is a learner, blogger, speaker, educational evangelist and Dad. As a former teacher and Director of Instructional Technology he is highly sought after for his expertise in educational technology integration and using social media for learning. As @web20classroom he regularly travels the country talking to schools and districts about the use of Social Media in the classroom and how they can better serve students through technology. Steven has been a presenter and keynoter at several educational technology conferences, including ISTE, ASCD and FETC, VSTE as well as numerous state and local conferences. He is also responsible in helping create #edchat, a weekly education discussion on Twitter that boasts over 500 weekly participants. 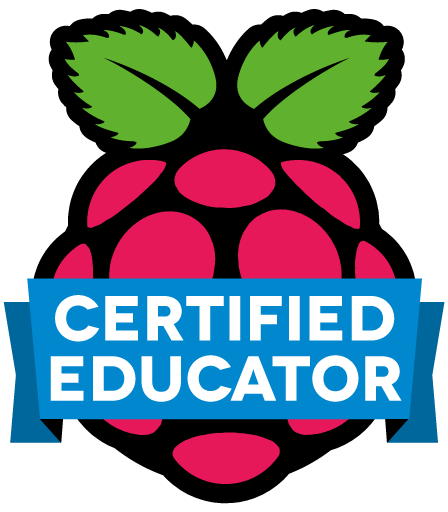 Steven has been recognized with the the 2009 and 2011 Edublogs, Twitterer of The Year Award, a Microsoft Heros of Education award, along with a 2013 Bammy Award, recognized worldwide as the Educational Emmy, for his work with #edchat. Interested in Chromebooks? 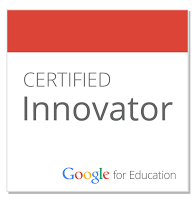 Intel has collected amazing resources by wonderful educators that share the wonderful things that can be done with Chromebooks in the classroom. If you visit intel.com/ChromeEdu, you will see information from Erin Klein, Lisa Neilsen, Viki Davis, and more. You can also win an Intel-Powered Chromebook following @IntelEDU and tweeting which Intel-powered Chromebook feature is your favorite. Use hashtag #IntelChromebooks and you'll be entered to win a Chromebook with Intel Inside! Click here for more details. Chromebooks have been growing in popularity and I’m seeing more and more educators with them as well as students. I am always pleased with my experience using a Chromebook and I am a big fan of the Intel-powered Chromebooks. They load much faster than others and the streaming is just better in my opinion. If you are looking for a new device solution for yourself or your classroom, Intel-Powered Chromebooks is where you should start your research. 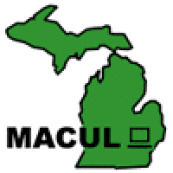 Check out their resources to see all of the great things you can do. I'm really excited to share with your my thoughts on the HP ElitePad 1000 G2. I've been playing with the ElitePad for a few weeks and I have to say that I am very impressed. I did not have the best experience with a Windows device when I used the Surface, but the ElitePad was very different. I was able to stream YouTube and Netflix without a problem and the sound was perfect. All of my favorite apps were opening quickly and I was able to easily take pictures and share them with friends and family. The battery life lived up to its billing. 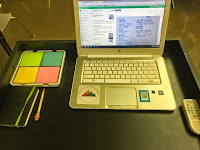 I used it during one full school day instead of my iPad and I was able to do everything I would have done with my iPad without missing a beat. Another great part of ElitePad was this wonderful accessory. I love this Docking Station. Most of these are just for your to set it up and charge. This does so much more. 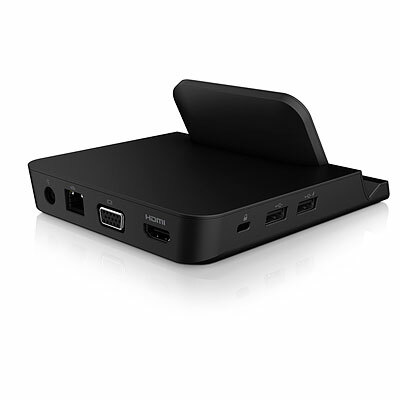 It has the USB ports as well as an HDMI and VGA port. I can connect the ElitePad to anything I want. I can connect it to my project in class and use it as another computer. I can just switch from one computer to the other without any problems. I could connect it to my TV at home and show a slide show or watch Netflix there. This Docking Station opens a world of possibilities of different use scenarios. I can do all of these things and charge my tablet at the same time. It is a wonderful collection of options that others need to start making standard for their docking stations. Overall, I have to say that I am a fan of the ElitePad. It does everything you want it to do and it does it quickly and it looks good doing it. Check out more info on the ElitePad here. Stuck waiting for an oil change? Hanging out watching soccer practice? Sipping a latte at the coffee shop on a lazy Saturday? ...But you still have virtual piles of student papers to grade in Blackboard? Pull out your iPad! Bb Grader enables teachers to view, provide rich feedback, and ultimately grade student submissions to Blackboard Learn Assignments from anywhere, anytime. Join us for a a live demo of the new Bb Grade App for teachers by Trey Buck, the Bb Grader Product Manager! Bb Grader is available to all Blackboard Learn customers. Trey is a Product Manager for Blackboard covering end-user services, including mobile products, SafeAssign, Profiles, and more. He has been with Blackboard for two years, and came from the acquisition of the Moodlerooms team where he worked on the xpLor product. Trey is a new father and enjoys soccer, tech, and beer! I'm constantly thinking about my learning environment right now. Every time I'm in my room, it's what I focus on. I moved my desks around after Back to School Night to a new formation and I'm not sure if I am sold on this. The students had mixed reviews, so more changes might be on the way. One student said it seemed too much like a conference set up. I'm not sure if that is a good thing or a bad thing. I do not like the fact the students have their back to the front of the room, but I'm trying to move away from the idea of a "front of the room". It really has me conflicted as I push myself away from the traditional classroom arrangement and more towards an open floor plan. 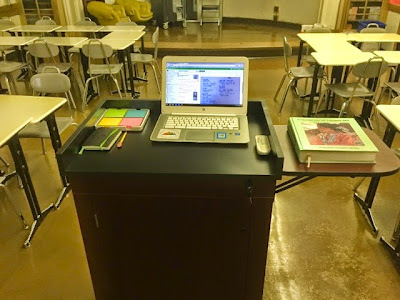 This allows me to have an open space to move and I have a mobile lectern coming shortly that will allow me to have my devices with me as I move around the room from table to table. I'm sure there will be more adjustments. I do want to give a shout out to VS for sending me the stool below. It is called Hokki and it is part of their Shift + line of furniture. It allows me to move freely without falling over. Students love it and other teachers have tried it out and have loved it. I am a fan and am seriously thinking about getting more for my room. VS also has other great furniture to check out if you are looking for some new additions to your classroom. VS also has a great book they put together with the help of OWP/P Architects and Bruce Mau Design called the The Third Teacher. The book is about learning spaces and how important they are to education. There are so many great examples and innovative ideas in the book. It has helped me rethink they way I look at my room. Take a look and see how it might help you. That is it for now, but stay tuned for more updates and check out my #NerdyCast on YouTube for weekly updates/reflections on my week teaching. Julie Evans has been CEO of Project Tomorrow (www.tomorrow.org), one of the nation’s leading education nonprofit organizations, since 1999. She developed the Speak Up National Research Project in 2003 and has served as the chief researcher on this project and other digital learning national research projects. Previously, Ms. Evans enjoyed a 17-year career in national and regional sales and marketing management with Unisys and two education technology startups. She is a graduate of Brown University and serves on the Board of Directors of Project Tomorrow, the Reaching At-Promise Students Association Advisory Board, and the TechSETS Advisory Board. She is a frequent speaker, writer and commentator on K-12 and higher education issues around digital learning. Ms. Evans was named in April 2008 as one of the Top Ten Most Influential People in Education Technology over the past 10 years by eSchool News. The dynamic profusion of emerging technologies, both in school and out of school, is propelling today’s K-12 students to make new demands on their schools for a dramatically different kind of educational experience. Enabled, empowered and engaged, our students have a unique vision for 21st century education that reflects their desires for social-based learning experiences that are un-tethered to the traditional classroom, and rich in digital media and content. The annual Speak Up National Research Project provides an exclusive window into the views of students on personalized learning and new classroom models. In this webinar, we will share the latest Speak Up national findings from over 403,000 K-12 students, parents and educators with a special emphasis on the how today’s students want to be engaged with mobile learning, online and blended learning, and e-textbooks and digital content. 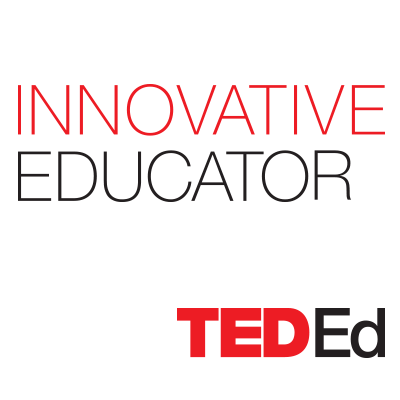 The discussion will provide new insights into the digital disconnect between students and educators, and stimulate conversations about how to effectively leverage new classroom models of innovation to drive both increased student achievement and teacher productivity. Yesterday was the first day of school and I thought about it and wanted to share some reflections. I was able to see my #NerdySpaces in action for the first time and I have some mixed feelings. I was moving around the room much more than before. I had over 16K steps. That is crazy for my classroom. I was able to freely move around the center of the room. The students seemed a bit crowded. I told them the room would be changing based on their feedback, so there is plenty of room for change. For the first time ever, I did an ice breaker to start of the school year. I normally just go over class procedures, but decided to change I up. The students had a blast and my new principal stopped by and even helped out. You can find some pics searching the hashtags #MRPAL and #MRPFROSH. I felt like I did not have the same flow I normally have going over this information. I felt my timing was off. I'm not sue, but it was something I noticed and I wonder if the students did. There is so much promise in meeting your classes for the first time. You do not know the students and you think every single one of them are capable of amazing things. I'm excited to learn about all of my students, their dreams, passions, and everything else that matters to them. I hope others who started yesterday had an amazing day. The school year is starting today for many teachers and students around the country. After 13 years, I still get the butterflies. I used to think I was nervous about my lessons or the impending grading of assignments, but I think the butterflies are a bit different. 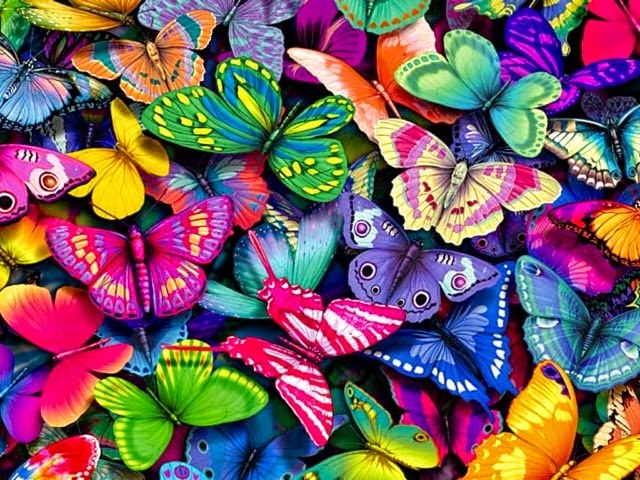 I think I have the butterflies because I'm excited about the untold possibilities in the coming year. With 20 Time starting its second year in my class, I'm excited to see what my students will undertake. I'm also excited to start trying some of the fun things I learned from my friends over the summer and I can't wait to see how my dedication to learning spaces is going to influence my daily routine. There are so many possibilities, that it is hard to concentrate! Another thing I will be doing is creating a short video on my #NerdyCast to reflect on the week. I have one up already and I look forward to adding more as I really try and dive into my practices this year in an attempt to look deeper into what I'm doing and not doing. I'll still be doing longer podcasts with Tim, we just need to flesh out the schedule. For everyone starting today, I hope you have an amazing day and I look forward to learning and sharing this school year.